The femoral nerve is located in the leg and supplies the muscles that assist help straighten the leg. It supplies sensation to the front of the thigh and part of the lower leg. One risk of damage to the femoral nerve is pelvic fracture. 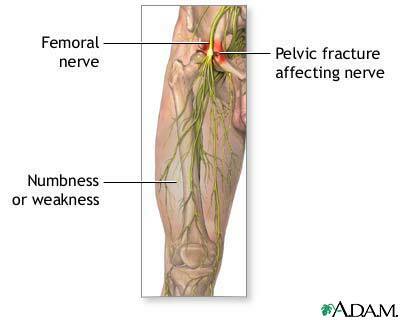 Symptoms of femoral nerve damage include impaired movement and/or sensation in the leg, and weakness. If the cause of the femoral nerve dysfunction can be identified and successfully treated, there is a possibility of full recovery.